Hannah Genders makes a list of her favourites. It doesn’t matter if you only have a small garden– there is something for every situation in my list below. So get planting and enjoy the wonderful colours at this time of year! This is a wonderful tree, with every colour from orange and red to deep purples displayed in its autumn leaves, but don’t plant this one if you are short of room – they grow to over 12 metres and have an eventual spread of eight metres. They like a well drained soil and are at their best as a specimen tree in front of a woodland planting. Most of the Acer palmatum, or maples, are known for their fabulous autumn colour; the Acer grove at Westonbirt Arboretum near Bath is a great place to see them at this time of year. Some of the cultivars (cultivated varieties) have more deeply divided leaves, such as Acer palmatum dissectum – as this is slow-growing and smaller in height, it is ideal for those with less space. One of my other favourite maples, as much for its bright red stems as its leaf colour, is Acer palmatum ‘Sango-Kaku’, also known as the coral bark maple. This variety needs more room as it will eventually reach a height of six metres, but takes a long time to get there. When planting any of the maples put them in a sheltered spot, away from strong winds and in dappled shade, as they are a woodland plant. I’ve never understood why this elegant tree is not more readily available in garden centres as it is a so lovely. It has rounded leaves which start out bronze in the spring and then turn yellow and red in autumn. As if that’s not enough, the leaves smell of burnt toffee as they fall to the ground. The beauty of the Sorbus or mountain ash tree is that it has attractive yellow leaves in the autumn along with clusters of bright red berries, the two contrasting well and giving a stunning display at this time of year. There are many cultivars of the Sorbus family, so if you don’t fancy the red berries you can choose yellow, pink or white. These are tough trees and do well in most garden situations. The added bonus is that the berries provide food for the birds too. If you want a small tree that will do two seasons of interest in your garden, this cockspur thorn is the one to get. Its glossy dark green leaves turn bright yellow and red in the autumn, while the pretty white flowers that have appeared in spring will become deep red fruits during the autumn months – next to the leaves the colour combination is quite dramatic. This lovely shaped tree will only reach about 20 feet, so ideal for a smaller garden situation. This large shrub or small tree does virtually nothing all year; it suckers from the roots which really annoys gardeners, but in the autumn the leaves turn a fiery red and orange, just to remind you why you bought one. And don’t go for the common one – choose the variety ‘lacinata’ which has deeply divided leaves to rival any of the maples. The shrub has an open habit, so plant it to full effect at the front of a border. We know the value of the prunus or flowering cherry trees in the spring, with their short-lived but stunning pink or white flowers, but to get good value from a tree choose a cherry that has good autumn colour – and this is one of the best. Commonly known as Sargent’s cherry, it is a small, rounded tree with leaves that start out bronze and then take on the dramatic autumn colours later in the year. If you have the room, plant a whole avenue of them and enjoy the leaves on the ground as well as on the trees. 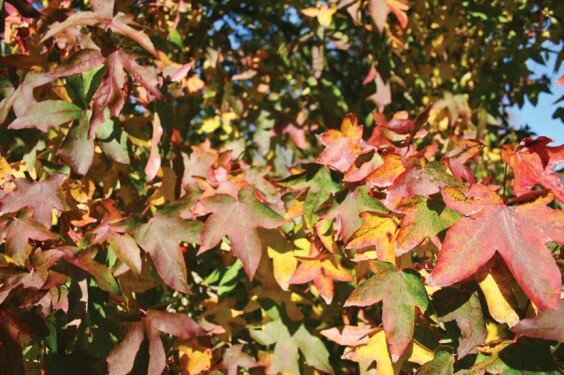 Also known as the Persian Ironwood tree, this can be grown not only for its wonderful autumn colour, which like the Liquidambar can have several colours on one leaf, but also for its intriguing shape that can be a feature in itself. Use this tree to best effect at the front of a border or hedge to enjoy all it has to offer. It is a small tree with spreading habit and attractive, flaking bark, and it also has deep red flowers on the bare branches during the winter and spring.